Hair growth is the result of heredity and hormonal levels. Also, some drugs, temporary methods of hair removal, and some illnesses can stimulate hair growth. Usually, hair growth is desirable. Ideally suitable for a woman's upper lip, chin or bikini line if Laser Hair Removal is not a suitable option. Since many factors influence hair growth, you will need multiple sessions. The total number of sessions needed to remove hair permanently from a particular area will vary from person to person. Most clients return once a week or every other week, as necessary. Myth #1 Temporary methods of hair removal can be better. Chemical depilatories (liquids or creams) are often used to remove body hair. These products not only contain irritating chemicals but can be time-consuming and messy. Just imagine this - while the depilatory cream/lotion is on your skin and is gauging your hair, think of the potential damage to your skin! Likewise, bleaches contain harsh chemicals and often do little to disguise dark hair. All these chemicals may also discolor the skin with prolonged use. Myth #2 Waxing is better than electrolysis. Waxing is a quicker method of hair removal than electrolysis but it can be costly for a lifetime of treatments because it is only a temporary method of hair removal. Before Lasers came along, Electrolysis hair removal was the only method approved by the FDA for permanent hair removal. Permanent hair removal cannot be 100% guaranteed for anyone, because dormant hair follicles can and will produce hair. Maintenance is therefore recommended. 1. Studies that have been conducted have indicated that Electrolysis is known to have the best overall results, versus any other method, in ridding hair for long periods of time - or even permanently. These studies do not include the excellent results that can be quickly achieved with Laser Hair Removal. 2. Many different hair and skin types can benefit from electrolysis because it does not target hair pigment (color) like the Laser does, but instead attacks the hair follicle(s). In our practice we have found it particularly useful for treating blond/white hairs that have no pigment in the hair follicles For people that are not good candidates for Laser we recommend electrolysis for permanent hair removal. 1. Previous waxing, tweezing or naturally curly hair can make hair follicles distorted. Distorted hair follicles can make it harder in getting the probe to the root but it is possible to do it. 2. Because multiple treatments are needed, you have to truly be committed to electrolysis. Whenever suitable, we recommend Laser Hair Removal over electrolysis for its efficacy and savings of time and money in the long run. Electrolysis is a method way of removing unwanted hairs from the face or body, one hair follicle at a time. Today's medical electrolysis devices destroy the growth center of the hair with chemical or heat energy. A very fine probe is selected based on the thickness of the hair to be treated. The probe is inserted into the hair follicle at the surface of the skin and after it is treated with a miniscule amount of electrical current, the hair is gently removed tweezers. There are three basic methods for electrolysis: galvanic, thermolysis, and blend. All three offer similar results and involve a thin metal probe being inserted directly into the skin to the hair follicle. 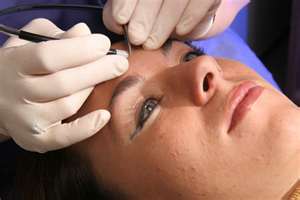 Success often depends more on the skill of the electrologist as well as the equipment or technique being used. Other factors that can affect your treatment include your hair type and your pain threshold. Modern technology has made electrolysis hair removal less painful. Galvanic Electrolysis - Galvanic electrolysis is the oldest type for of this hair removal method and successful cases being recorded as far back as 1875. It's not the electrical shock that destroys the hair follicle but a chemical reaction. Salt and water around the probe are chemically altered to produce sodium hydroxide, also known as lye. As the lye builds up, hair follicles are destroyed. Thermolysis Electrolysis - Thermolysis is different from electrolysis --the difference is that instead of using an electrical current, high frequency energy is employed which radiates out to the hair follicle(s) and heats the surrounding tissue. This heat is what damages the dermal pilla (base) of the hair follicle and ceases hair growth. Blend Electrolysis - Blend is a combination of both galvanic and thermolysis in one treatment. Our experience with Blend has been positive in that it is more effective than either thermolysis or galvanic electrolysis for thicker, coarser hairs. 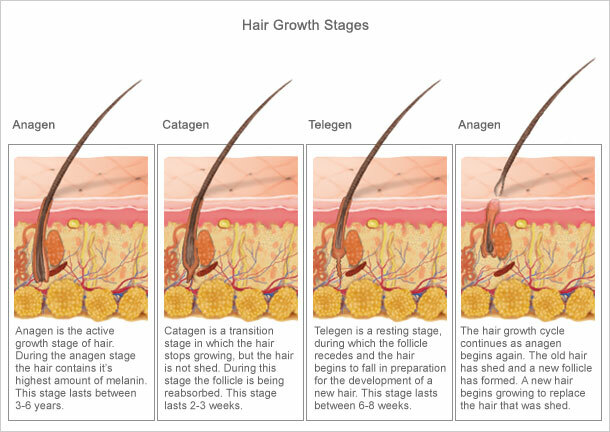 Hair grows in different stages: growing, resting and shedding. Because all of the hair is not at "growing" stage at any given time, multiple sessions are needed to get the hair in the growth phase for Electrolysis Hair Removal to be most effective -- just like with Laser Hair Removal.